These outriggers fit the W500 and W700 series, as well as canoes, and many common kayaks. Wavewalk® Sailing Outriggers provide more stability than most outriggers, thanks to the combination of larger size floats and longer arms (crossbar). Other advantages are their light weight (10 lbs total), ease of installation, and their versatility, as their inflatable floats can also be attached directly to the boat’s main hull, without any intermediary rigid structure. Shipping: $90. in the continental US (48 states), $100 to addresses in Canada and Alaska. The crossbar can be easily attached to a W500, W700 and any canoe that features a gunwale. Drilling is required. The crossbar can be attached to some kayaks too, and if this is not possible, straps can do the job. The crossbar features wing bolts – no tools required when attaching / detaching during regular operation. Each outrigger is quickly and easily attached to the crossbar by means of one eye bolt. No tools required. The tubes can be easily inflated / deflated via a large-size mouth valve. No pump required. The inflatable tubes are attached to the aluminum bars with carabiners, for quick and easy attach / detach. Outriggers main role is to provide secondary stability, namely help in preventing the boat from capsizing. If you’re counting on a pair outriggers as stabilizers, namely to provide primary stability when the boat is level (I.E. not tilting sideways), you’re probably not using them correctly, or not using the right boat, or both. When outriggers touch the water, they generate drag that slows down the boat. Therefore, if possible, the outriggers should be mounted high enough, in a way that prevents them from touching the water unless the boat tilts sideways dangerously, so much that the user and passengers could lose balance and the boat itself capsize. How high above the water should you mount the outriggers? The height depends on factors such as your skill level as a boater, the size of your sailing rig, and how reasonably confident you feel about being able to handle the situation before the outrigger touches the water and starts supporting the boat. Outriggers for fishing kayaks and canoes? If you fish out of a canoe or a kayak, the last thing you want is outriggers, because sooner than later they’ll snag your lines and provide great opportunities for the fish you hooked to get away. On top of this, most outriggers out there are too small and feature arms (crossbar) that are too short. These outriggers offer some initial (primary) stability, namely an impression of being stable, but they are not effective in supporting your weight in case the canoe or kayak tilts strongly on its side. In other words, the secondary stability these outriggers offer is insufficient in more difficult situations, and that’s when they’re mostly needed. For these reasons, we do not recommend using outriggers for fishing kayaks and canoes. Outriggers may add stability, but they also generate quite a bit of drag, and if you need to paddle over long distances you may find that the added outriggers make you too tired to enjoy your trip. What about outriggers for motorized kayaks and canoes? Not a great idea, unless the outriggers you use offer a sufficient amount of buoyancy, and most of them don’t. Again, thinking you’re stable isn’t the equivalent of being stable in real-world terms, namely as soon as you lose balance and the outrigger has to support your weight. If you want to motorize your canoe or kayak, get a pair of big outriggers. This is especially true if you use a powerful outboard gas motor, as those are not as forgiving as weak electric trolling motors can be. Practically speaking, if you want to sail a canoe or a kayak, you must compensate for these boats’ deficient stability (and compensate for their other deficiencies by other means*). Sailing a canoe or a kayak with a rig featuring a good size sail (say over 35 square feet) exposes you to sudden gusts, and to capsizing, and that’s where outriggers are a must-have. But not all outriggers were created equal, and the bigger the outriggers the better stability they deliver. And when it comes to stability, there’s no such thing as “too stable”. If you want to put the odds on your side (you do! ), you should get large-size outriggers. Boats from the Wavewalk® 500 and 700 series are more stable than any canoe or kayak out there, which is one of the reasons why you can motorize them more effectively, but sailing is different: If you’re planning to use a good size sail with your W, you should consider outfitting it with outriggers, and attach them as closely as possible to the mast, namely in the front section of the boat, where they would be more effective. * Canoes and kayaks track poorly, which is why they require a leeboard to reduce downwind drift, and a rudder to allow for tacking and tracking when they’re sailed. Wavewalk® kayaks and boats track very well, which is why you may sail them without a leeboard and a rudder, but only up to a certain point determined by your sailing skills, sail size, and wind power. 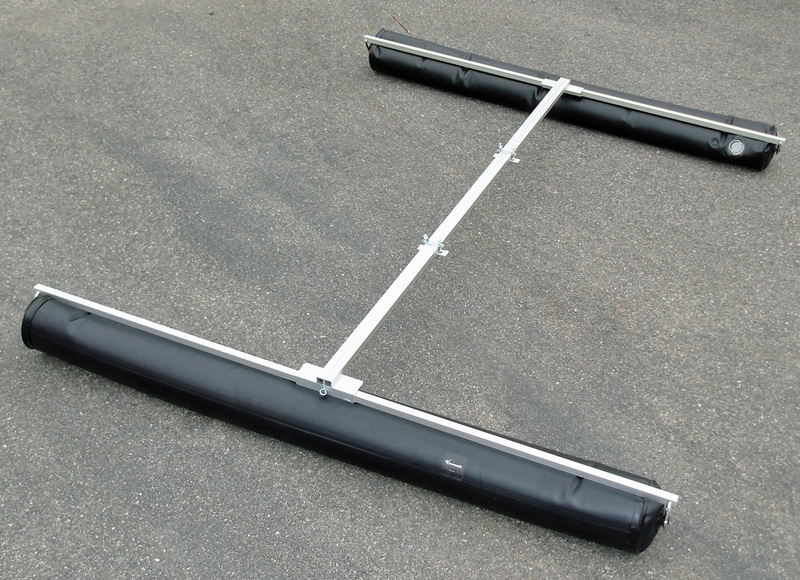 This new XL Outriggers product is not intended for use together with an outboard motor in the W500 and W700. In fact, it won’t even fit for this purpose, because installing it behind the motor would prevent the propeller shaft from going up (for both safety and convenience), and installing it in front of the motor would prevent the motor from tilting down as the propeller shaft goes up. Installing the XL outriggers in the front of the kayak could make the bow rise more than the user would want it to, since these boats perform better when they are more horizontal. Note that attaching the inflatable tubes directly to the sides of the boat at its rear end works to stabilize it, and helps in keeping it more horizontal at higher speeds. This improves steering, tracking, and overall control. I read this article closely because my grandchildren are coming down this summer. My intent is to construct a single Polynesian style outrigger for the port side of my W700 with coarse netting stretched in the frame between the boat and the outrigger. Not only is stability improved. The kids will have a little hammock to rest in. And, it will be much easier to board the W700 after snorkeling by sliding over the outrigger. Berny Marsden’s DIY Wavewalk seen in this movie is about as stable and high as the W700, so it can serve for comparison. Bottom line: Getting back into the W700 isn’t that much of a problem, even when done directly from the side. It’s also possible to take the long way, namely crawl in from the rear or the front, over the hull tips. The advantage in this method is that with your legs stretched to the sides you can control the vessel’s stability.